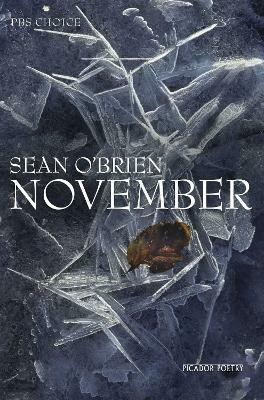 November is Sean O'Brien's first collection since his widely celebrated The Drowned Book, the only book of poetry to have won both the Forward and T. S. Eliot prizes. November is haunted by the missing, the missed, the vanished, the uncounted, and the uncountable lost: lost sleep, connections, muses, books, the ghosts and gardens of childhood. Ultimately, these lead the poet to contemplate the most troubling absences: O'Brien's elegies for his parents and friends form the heart of this book, and are the source of its pervasive note of depart. Elsewhere - as if a French window stood open to an English room - the islands, canals, railway stations and undergrounds of O'Brien's landscape are swept by a strikingly Gallic air. This new note lends O'Brien's recent poems a reinvigorated sense of the imaginative possible: November shows O'Brien at the height of his powers, with his intellect and imagination as gratifyingly restless as ever. Sean O'Brien's poetry has received numerous awards, including the T.S. Eliot Prize, the Forward Prize (three times), the E.M Forster Award and the Roehampton Poetry Prize. His Collected Poems appeared in 2012. Europa is his ninth collection. His work has been published in several languages. His novel Once Again Assembled Here was published in 2016. He is also a critic, editor, translator, playwright and broadcaster. Born in London, he grew up in Hull. He is Professor of Creative Writing at Newcastle University and a Fellow of the Royal Society of Literature.